Stanton (lower leg) was waived from the Vikings' injured reserve list Friday, according to the league's official transaction log. Analysis: Stanton spent the entire 2018 season on IR due to an unspecified leg injury that required him to be carted him off the field during Minnesota's preseason game against Jacksonville. 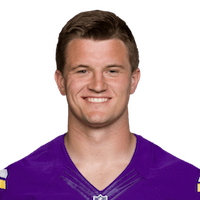 It's not clear if the fullback and former UNLV quarterback is recovered at this stage, but he's immediately free to sign a contract with any another organization outside of Minneapolis upon clearing waivers. Stanton (lower leg) cleared waivers Tuesday and reverted to injured reserve, Chris Tomasson of the St. Paul Pioneer Press reports. Analysis: It's still unclear how severe Stanton's injury is, but it's bad enough for the Vikings to have cut him. If he's able to reach an injury settlement and get healthy, the 23-year-old will be able to sign with another team. The Vikings signed Luke McNitt and Kobe McCrary to compete with C.J. Ham for the fullback job. The Vikings waived/injured Stanton (lower leg) on Monday, Andrew Krammer of the Minneapolis Star Tribune reports. Analysis: The undrafted rookie was carted off the field during Saturday's preseason loss to the Jaguars, signaling a serious injury. With Stanton dropped from the roster, C.J. Ham is the last fullback in Minnesota and is expected to make it past final cuts. Stanton was carted off the field during Saturday's preseason game against the Jaguars due to a left leg injury, NFL Network's Tom Pelissero reports. Analysis: Stanton appeared to have suffered a potentially severe lower-leg injury during the fourth quarter of Saturday's tilt, so an upcoming long-term absence is not out of the question. Stanton's injury leaves C.J. Ham as the Vikings' lone healthy fullback, so he could have a much clearer path to securing a spot on the 53-man roster. There are no videos available for Johnny Stanton. Click here to view all videos.